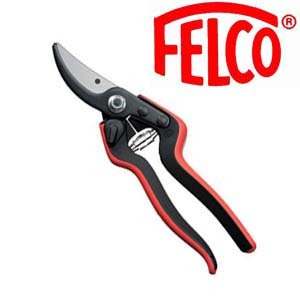 LA Garden Blog : Felco Pruners Are HERE! The initial stock of Felco pruners and Swiss Army Knives are in stock now! I have F-6's, 8's and 11's as well as the new composite handle pruners, 160S (for small hands) and 160L (for large hands - that's it in the photo). I have a couple of sharpeners, holsters (like the one I use) and a few Swiss Army knives for grafting. Contact me via my email address, or by phone to arrange a pick up time. Did I mention these make fabulous Christmas presents to any gardener no matter what kind of garden they have? The 160's are perfect for those who don't garden a lot but yet need a quality pruner that is lightweight and durable - the composite handles are made from recycled materials and are themselves recyclable - and replaceable so they have the same life-time quality as the original Felcos. Like the entire Felco line, they are built to be a life-time investment. I am proud of the opportunity to be a Felco representative and I know my prices are competitive (really competitive) and I repair, resharpen and refurbish Felco pruners that have been abused and need some TLC. You can find me at The Learning Garden at Venice High School, most Wednesdays through Sundays, 10 AM to 5 PM. I hope I can be of service to you.